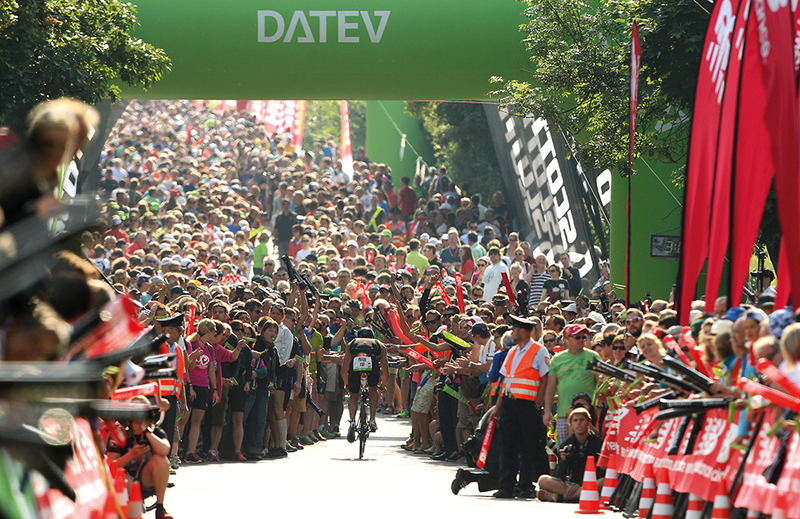 DATEV Challenge Roth is a great event with lots of Hot Spots But how do you get from A to B, and how can you watch as much of the race as possible? We have created three tours for you to experience and enjoy the race day in three different ways – depending on your individual preferences! Take a walk to “Solar Hill”, the most famous hot spot on the bike course (to get there, walk along Allersberger Strasse towards Hilpoltstein town center, then follow the crowds, it will take you about 25 minutes). The leading male athletes are expected to arrive at Solar Hill at 8:54 a.m. After that there will be enough time for you to stay there a little bit longer to enjoy the extraordinary atmosphere and to take a coffee break. Walk back to the Heuberg parking area and drive to Roth via Allersberg. Park your car near the construction market (turn right shortly before you reach the city of Roth). There will be a spectators’ shuttle service (near the kitchen store) every 15 minutes. Take the spectator’s shuttle to Roth landing stage at the canal, which will take you directly to the run course – another hot spot where you can cheer on the athletes during their marathon race. Take the spectator’s shuttle again and get off at Münchener Strasse. From there it is only a short walk (approx. eight minutes) to the triathlon park. Now you can take some time to relax, to look round the triathlon expo, to have some food and drinks and then get hold of some good places at the triathlon stadium. The male race winner is expected to cross the finish line around 2.05 p.m. (which would be a new world record). You should not miss that moment! The female Challenge winner will cross the finish line at about 2.53 p.m. (which would be a new world record as well). Leave your car at Heuberg parking area and go to the swim start. The starting signal will be given at 6.30 a.m. Make sure you get a place on the bridge (because form there, it will not be far for your to reach your car afterwards). You will have enough time to watch the first three or four start groups. Get back to the parking area and drive to Greding in the southern part of the county. This is where the athletes will have to face the longest and steepest climb of the bike course at a popular hot spot - Kalvarienberg, the “hill of pain”. Here is how you can get there by car without any traffic problems: drive in the direction of Allersberg until you reach the motorway entrance (A9), enter the motorway in direction of Munich and leave it at the exit “Greding”. Park your car at the Greding town center and take a 2 to 3 minute walk to Kalvarienberg. The leading male athletes are expected to arrive there for the first time at 8.04 a.m. and for the second time at 10:01 a.m. While you await the top athletes’ second lap you will have enough time to take a hearty breakfast consisting of the typical Bavarian “Weißwurst” sausages. Go back to your car and drive to Roth (A9 motorway direction of Nuremberg, take the exit “Allersberg” then go to Roth on Staatsstraße 2237). Park your car downtown (see section “parking spaces”). From there take an 8 minute walk to transition zone 2 in Hilpoltsteiner Strasse (the way will be signposted). Go on to the triathlon park (finish line area), it will be a walk of about eight minutes. 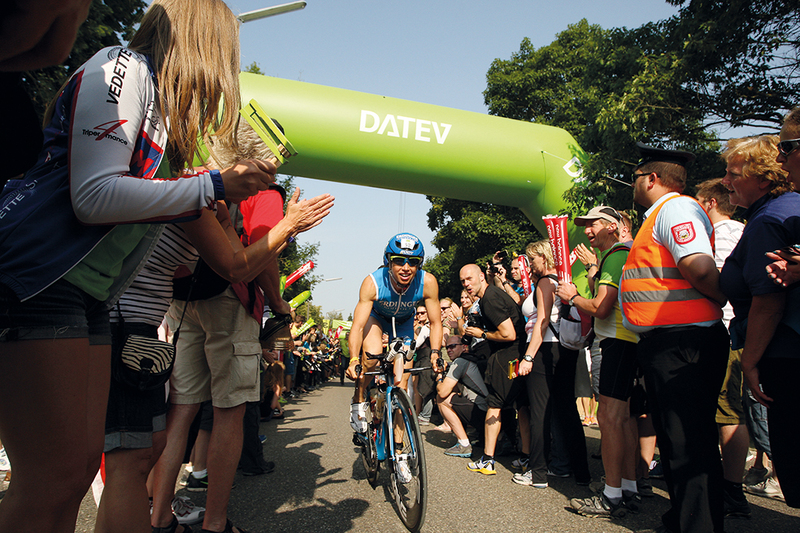 On your way you will have time to watch and cheer on the athletes on the run course at Hilpoltsteiner Strasse / Am Espan. They will be really happy about some support by now! It is high time now to get a seat at the stand of the triathlon stadium, because this year’s Challenge winner is expected to cross the finish-line shortly (2.05 p.m. would be a new world record)! All you need are your feet! First, go to Heuberg by car to watch the swim start. Leave your car at the Heuberg parking area and go to the swim start. There, you will have enough time to watch the first start groups (start of the first group including the top athletes: 6:30 a.m.) and enjoy the unbelievable early-morning atmosphere at the canal. Take a walk to “Solar Hill”, the most famous hot spot on the bike course (to get there, walk along Allersberger Strasse towards Hilpoltstein town center, then follow the crowds, it will take you about 25 minutes). The leading male athletes will now reach the famous “Solar Hill”. Afterwards you will have enough time to take a coffee break. Now take a walk back to the car and drive to Roth via Allersberg. Park your car at downtown (see section “parking spaces”). From there it is a 15 minute walk to Transition Zone 2. The first athlete arrives at Transition Zone 2. Along the run course via Hot Spot “Am Espan”, take a left into Gartenstraße and head towards Kugelbühlplatz and market place via the hotspots “Intermediate Sprint at Kosta’s” and “Challenge Women”. Start your walk back to the triathlon park soon enough to see the first finisher. To the triathlon park in order to watch the finish of the top male (approx. 2.05 p.m.) and female athletes (approx. 2.53 p.m.) live! Now there is enough time to visit all the Hot Spots along the run course or to go to Büchenbach or landing stage via shuttle bus (see below). A large variety of refreshments are offered at all hot spots along the bike and run course, where spectators can enjoy cool drinks, barbecue, typical Bavarian “Weißwurst” sausages, coffee and cake and much more. 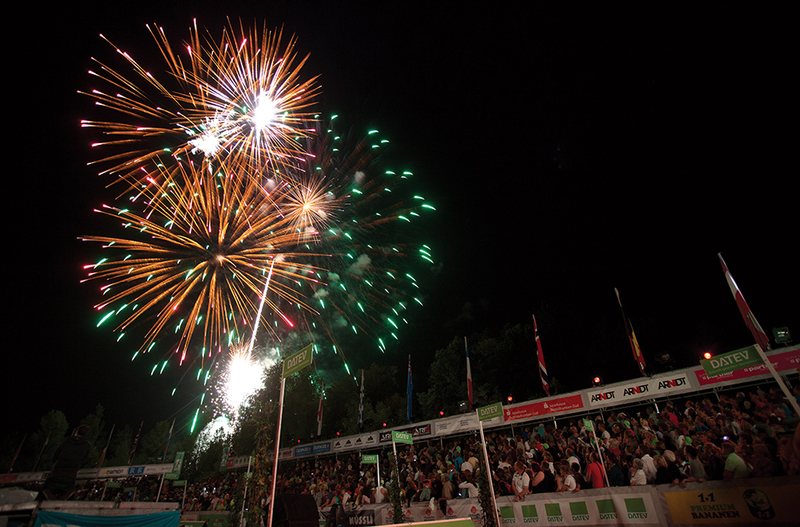 If you have not been at the finish line party and the fireworks you have not been at DATEV Challenge Roth! The evening event, which will take place at the triathlon stadium at about 9 p.m., is an absolute must-see. The last finishers will be literally “carried” across the finish line by the spectators and the atmosphere will be vibrating with the crowd’s enthusiasm. After the official closure of the finishline at 10.55 p.m., gigantic, musically synchronized fireworks will be the perfect finale of a long and wonderful day.